Hello everyone, my name is Violeta Scrap and I am so excited to share this layout with you using Amy Tangerine´s collections. This layout is about my travel to Malaysia. 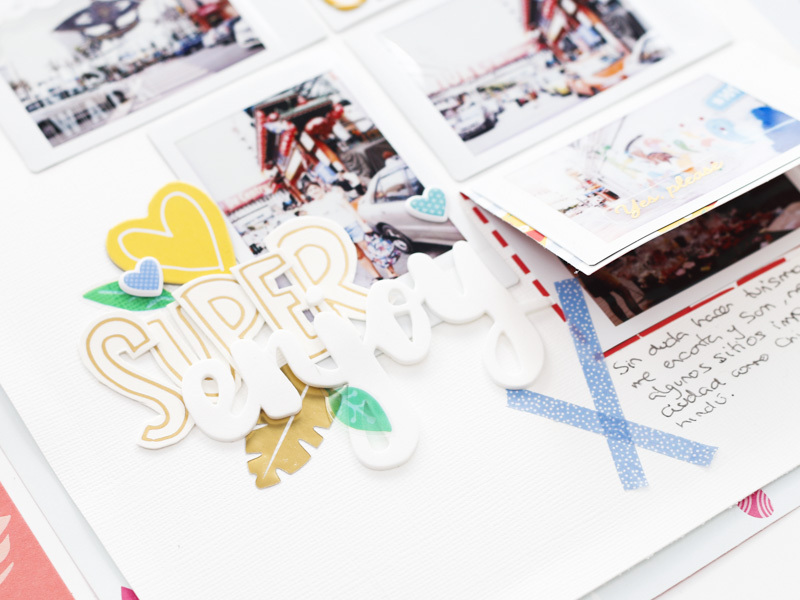 I have used pictures from my printer INSTAX Share-SP2 for our Layouts, it is perfect to use small photos, to be able to place many photos in a Layout. I had so much fun with this page and was surprised at how quickly it came together. I started out with a white sheet of cardstock and I decided to add my pictures. On this layout, I used a combination of so many of my favorite things: small pictures, stickers, and a smattering of letters and stickers. I really love playing with this collection, it´s so full of amazing products. This collection is absolutely amazing! I cuted a word from one tag and used them in the page as ephemera. My title “Enjoy” was also made using Thickers from “Oh happy life” collection. I really love mixing different materials so I included clear stickers, chipboard, stickers, enamels, Thickers and washi tape. Some of my top favorite elements in this collection are the golden words designs. I´ve written my journaling with a black pen. I love the look of handmade journaling. Also, if there's something specific that you are struggling with, or if you have any doubt about scrapbooking, let me know in the comments and I'll try to help you.